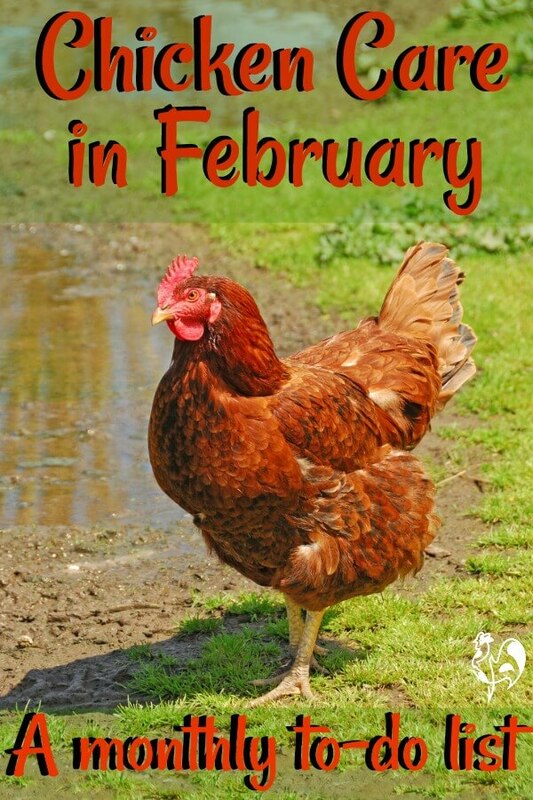 Raising backyard chickens in February - a to-do list. Your 20 monthly to-dos to keep your flock safe, healthy and happy through this chilly winter month. 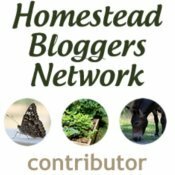 Are you in my newsletter group? If so, you'll be able to download your simple checklist for this month's tasks from the newsletter which comes to you in the first week of the month. If you're not in my newsletter group - why not join? You'll get a free checklist of tasks every month! Click here for more information. February in the chicken coop is not the happiest of times - at least in the northern hemisphere. Snow and rain may mean the flock have been unable to get out much. The damp can take its toll in health; cold can cause issues we've already seen (and hopefully dealt with) in our December and January to-dos. Of course in the southern hemisphere, you're dealing with exactly the opposite. 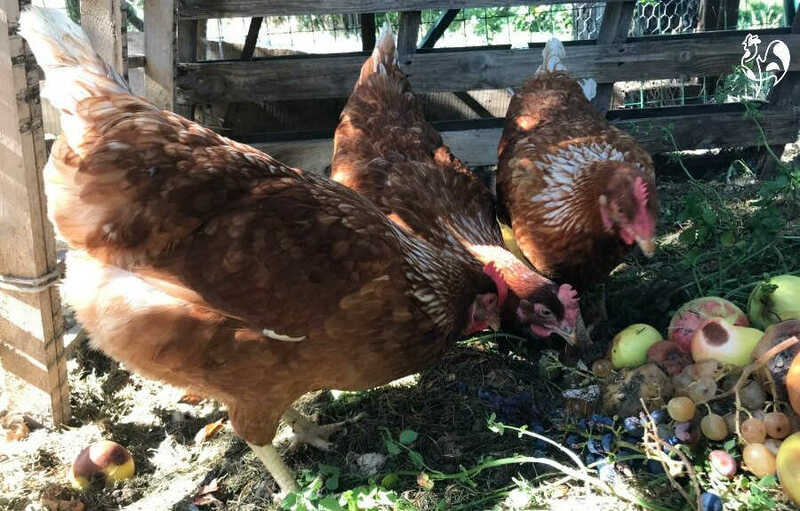 If you're helping your chickens deal with the heat of summer, see this page for more information. This month's tasks are related to helping your girls (and boys!) keep occupied, and looking forward to the Spring. Let's deal with bored hens first. 1. Are your chickens bored? Help keep them active! But it's been four months now since we started dealing with the effects of late autumn and then winter setting in. In some areas, the weather may mean that you've had to keep your flock - literally - cooped up for at least part of those months. They're in a much smaller space than they have in the summer. They're not able to forage as much as they have been used to, and even if you allow them outside, wind, rain and snow can mean they choose to huddle together somewhere sheltered. That can lead to bored chickens. 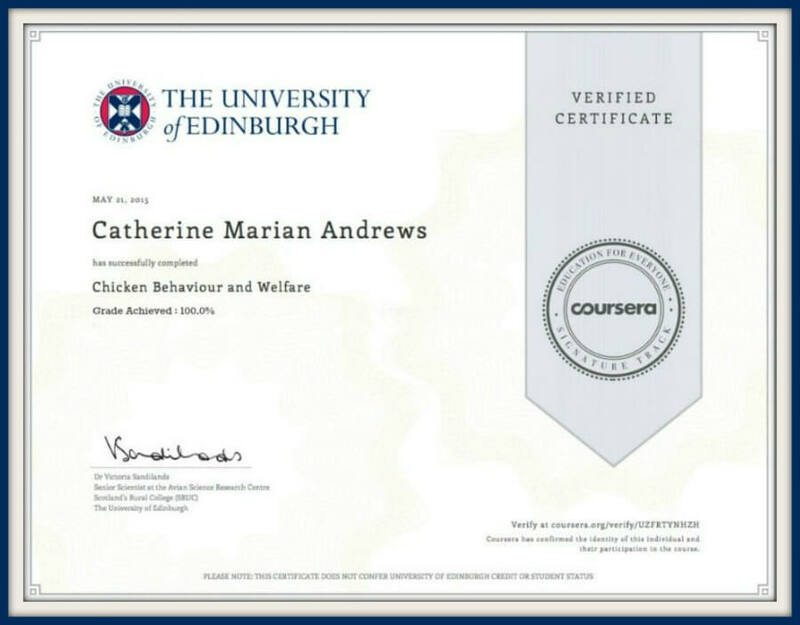 And bored chickens can mean different problems that you really don't want to have to face, including feather-pecking, aggression and egg-eating. Is there anything to be done? Absolutely! 1. My favourite of all time is the "kill the swinging lettuce" game. String a lettuce from the ceiling of your coop, or from a tree if they're able to get outside. Hang it just above the chickens' heads and watch them attack. For variety, use a whole cauliflower, broccoli or corn cobs - whatever veggies are in season in your area. Action shot! Some of my Red Stars play "kill the swinging lettuce". They've reduced the lettuce size so much it's time to lower it. 2. Give them some food to forage for. 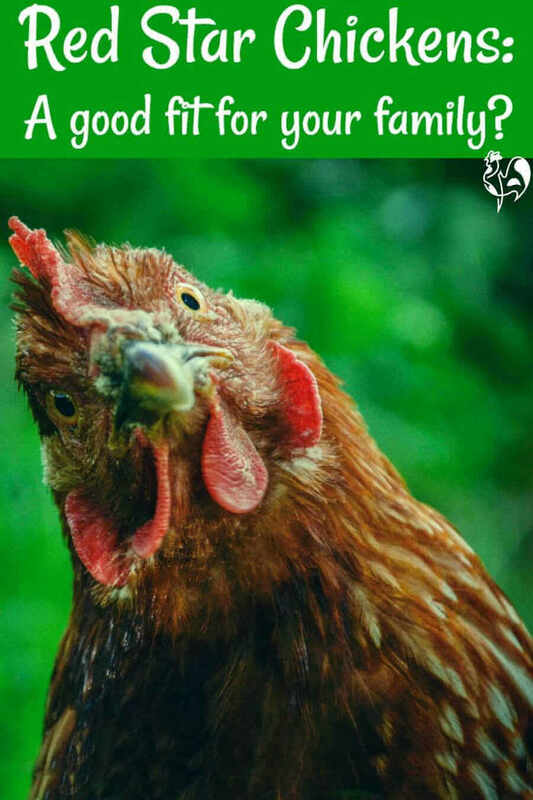 You don't need to buy or make special gadgets - simply toss a handful or two (depending on the size of your flock) of treats into their coop if they're locked inside, or onto the ground if they're in the great outdoors. I try to add a bit of variety (I'm sure my hens love me for it!) by varying between corn, barley and mealworms. As with all high protein treats, though, use sparingly. 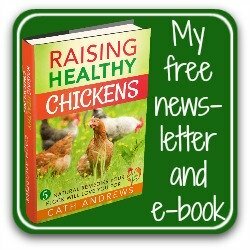 Chickens who aren't able to get out much and have lots of treats can end up with health problems. 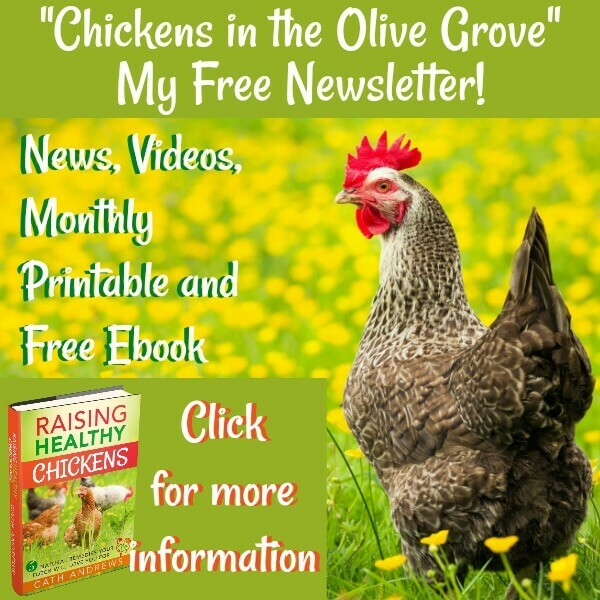 Obesity in hens is a known factor in Sudden Chicken Death Syndrome, for example. 3. Give your hens a "jungle gym" - just add some stumps and logs to the run at different heights. You can actually buy (believe it or not) a "flexible chicken ladder" to string between trees. My advice? Don't bother. I bought one for my flock and it ended up discarded and rotting in favour of a few different sized logs and branches. This type of toy is meant for parrots. And your chickens are not parrots. 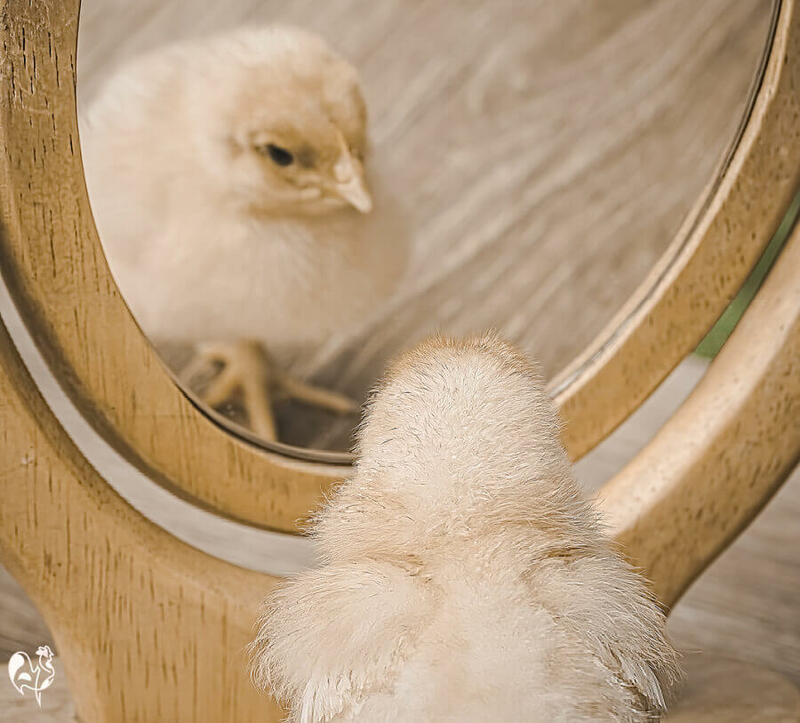 From a very young age, chickens seem to be fascinated with their own reflection. Do they see themselves, or do they think their reflection is another chicken? But it's a fun way to give them something to peck at so that they're not pecking at each other. You really don't need to go to any expense with this. Hunt around the house for a long-forgotten old mirror whose silvering has begun to tarnish, or which has a slight crack - chickens really aren't insistent on perfection! If you don't have one, buy inexpensively from a local hardware store. 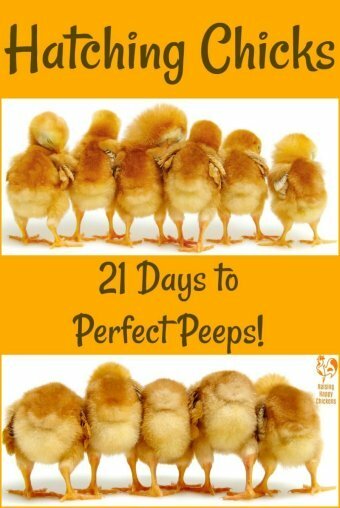 Now simply attach to a wall in the coop and stand by to watch the girls having some fun! 2. Muddy yard? Try this. February can be a very wet month, whether that's from rain or snow falling and then melting. 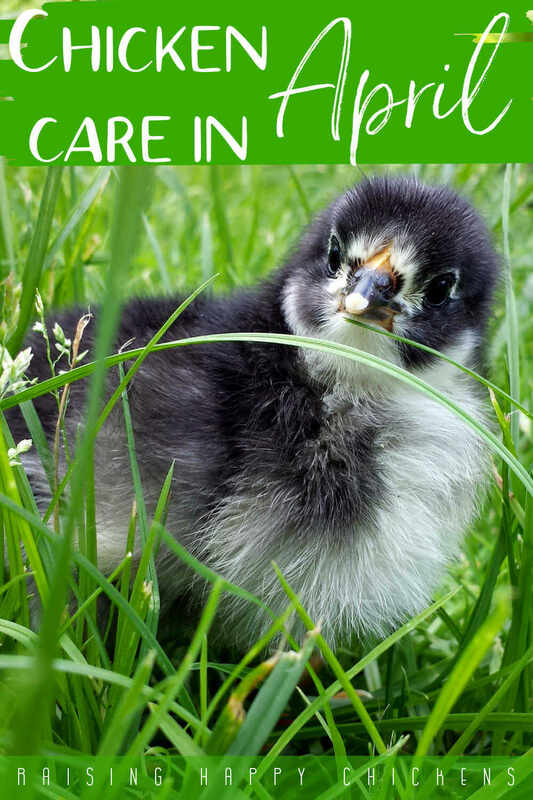 We know that damp can be a chicken nightmare - and damp plus cold can create frostbite. Way back in October we dealt with making sure coops aren't damp, but what about if the rain turns your run to a mud bath? Pine shavings or sawdust aren't an option - they soak up damp but don't get rid of it. Mud left on chickens' feet is not an option. 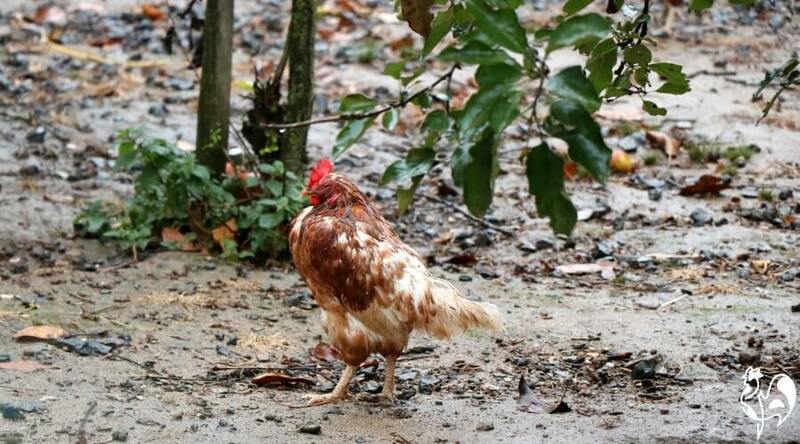 It's painful - and mud in runs can lead to slipping, and slipping can lead to dislocated or even broken chicken legs. You need to keep the run dry and learn how to clean those mud balls, just in case. 5. Cover your run. Even if you have a large run - which I do - it's possible to cover part of it fairly easily with a large tarpaulin. You don't need to cover the entire thing - section off one corner. Having a small outside space is better than having none. Make sure the tarp has strong grommets which you can use to tie securely to the sides of your run so that winds don't blow it away! Something like this is ideal. 6. Make a boardwalk. Pallets are good for this. Make a walkway across the mud bath to a drier area, if you have one. 7. Examine your flock's feet. If the worst happens and your chickens' feet become clogged with mud, it can harden so it's like cement which is painful and can potentially cause foot disease. So keep an eye on your chickens. If their feet are showing signs of logging with mud, take action. 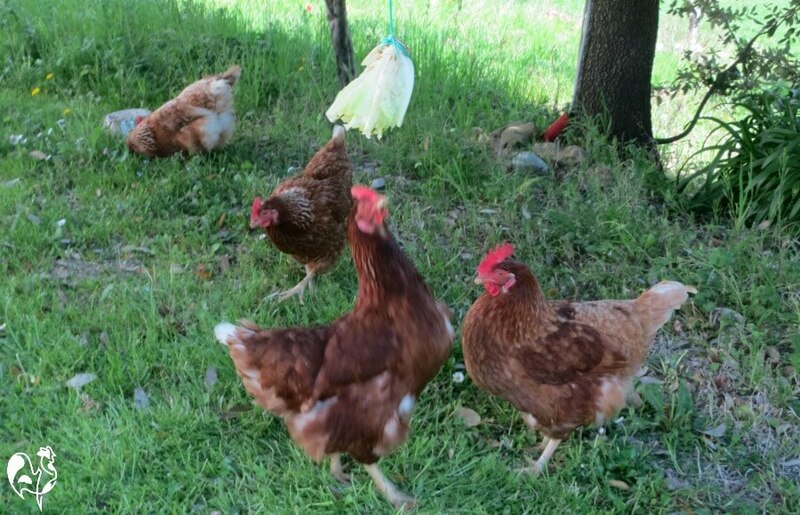 Before you need to use it, learn how to remove mud balls by giving your chickens a pedicure! This entertaining video will show you how. 8. Use pine pellets. This is not pine shavings - it's shredded pine which is compressed into a pellet. Spread on the mud - add in a bag or two of pine shavings if you want to lower the cost. It's commonly used for horses. The pellets soak up the moisture, expand and then fall apart. 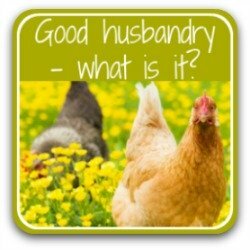 Which leaves your chickens with fluffy sawdust instead of sticky mud. And no - they don't eat it! Make sure it is not scented. If you can't find it at your local feedstore which is likely to be cheaper, you can buy online. 3. How clean is your coop? We last talked about deep cleaning coops way back at the start of October, when we were settling our chickens in for the winter. Now, four months and a lot of rain, snow and wind later, it's high time we took another look at what other deep cleaning needs doing to keep the coop safe and healthy. Of course, a general clean of the coop should be done every day. Here, we're talking about whether another deeper clean is in order. 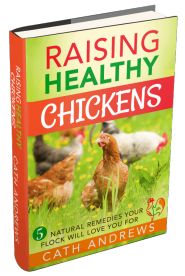 This is especially important if your chickens are not able to get outside much because of the weather. It's easy for a coop to become unhealthy very quickly. Bad hair day? 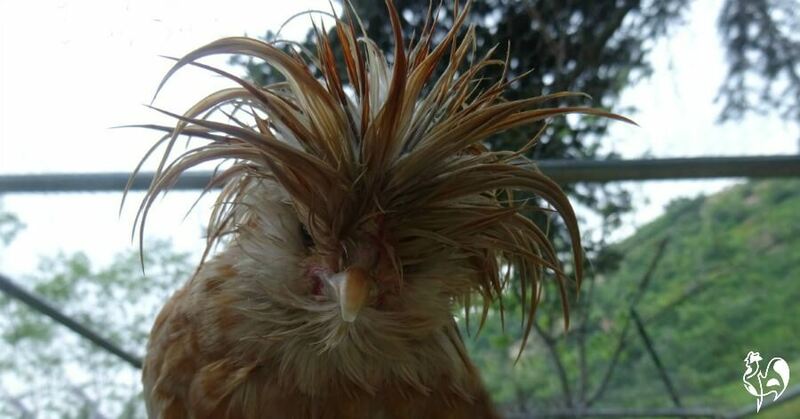 My Polish bantam, Kris, tries to shelter from the rain but often gets caught out! 9. 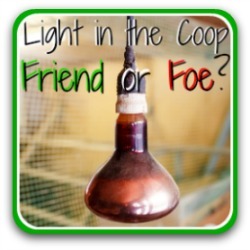 Assess the state of your coop. Is it smelling of ammonia? That's a sure sign it needs another deep clean. 10. Examine your roosting bars, nest boxes and walls. Are they covered in manure? If so, scrape it off now. You wouldn't want to sleep on a bed covered in dirt - why should your hens be expected to? 11. Consider a complete clean-out. In some parts it will be another two or three months before the chickens are able to stay outside most of the day. Don't think that because Spring is approaching, you can get away with leaving it. 12. Disinfect. Whether you have a total clean-out or not, make sure your nest boxes, perches, feeders and waterers are all kept spotless. Some people use bleach (one quarter cup of bleach to one gallon of water is the recommended amount) but I prefer to use vinegar. Apple Cider Vinegar, which I offer my hens from time to time, is fine to use - I dilute it with an equal amount of water. If the coop is really dirty, use a disinfectant wash like this one. Clean down all surfaces, and the floor. As we've seen before, chickens are likely to slow down their laying from the time they go into moult in the autumn until their hormones kick in again in the early Spring. During these cold winter months, you're likely to be getting far fewer eggs. So make sure you don't waste them! 13. Make sure to collect your eggs very regularly. If the temperature is below freezing, collect at least three times a day. That prevents the eggs from freezing, expanding and cracking. If cracking has happened, throw them away. Cracked eggs can absorb bacteria. 14. Stop egg eating. Bored chickens will turn to any activity they can. Eggs left for too long will become a focus of interest. And once a hen has begun egg-eating, stopping her will be very difficult. 15. If you need to buy store eggs (gasp!) try to find "pastured" eggs. Labels like "barn raised" do not mean the hens roam freely, only that they're raised in a barn. And often, those barns are as crowded and insanitary as caged hens' eggs. Barn raised hens - not as healthy as it sounds. 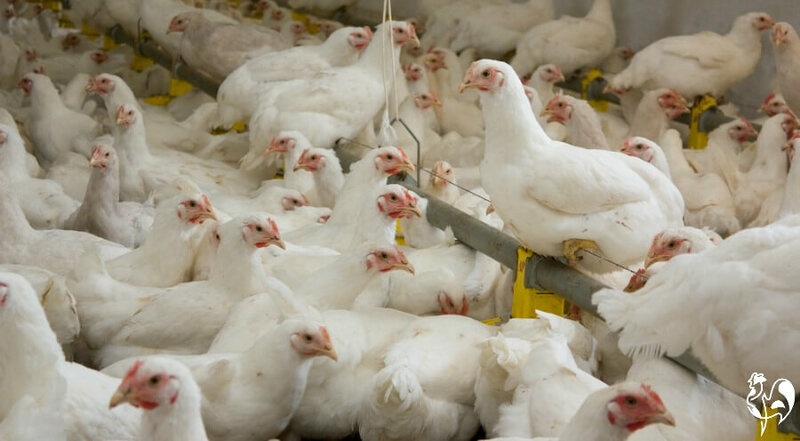 Crowded conditions get worse as the hens mature and grow larger. 16. Store eggs healthily. The debate about how to store eggs raises sometimes heated discussions. In Europe, eggs are not refrigerated as they are in America. At the end of the day, the choice is yours. 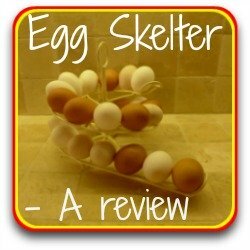 Find more information about storing eggs in my article, here. In the northern hemisphere it's likely to be cold and wet this month. 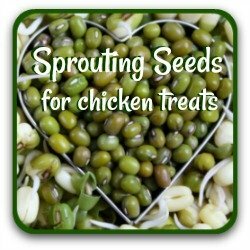 But Spring is just around the corner, and it won't be long before we can start thinking about planting crops to supplement our chickens' feed during the summer and into autumn (Fall) and winter. But before we head for the seed catalogues, we should use this month to start preparing the ground for a healthy start. Taking time now to loosen the soil and add to its fertility will pay dividends when we come to plant our chicken-friendly garden. Don't get caught out - start now! 17. Give all types of soil a boost by digging in some organic matter like manure (try your local farm or stables!) and compost. Adding air to the soil by lifting with a fork gives those beneficial micro-organisms a boost. 18. Warm up soil. lay soil? That's what we have in Italy. It's incredibly fertile - but takes ages to warm up. Give it a helping hand by covering your turned soil with plastic. For clay, use cloches which allow the water to evaporate. Other soils will be fine covered in polythene sheets. 19. Leave in place for at least four weeks - six is better. When you finally uncover it, you'll find a few weeds to be pulled and then - you're ready for those plants! 20. Make a compost bin! If you don't already have one, taking time now to create a compost bin will be a real boon in the months to come. It doesn't have to cost much - mine is made of four pallets strung together with wire, with a space at the bottom where the chickens can enter. Three of my Red Stars beat the rest of the flock to the goodies in my "designer" pallet compost bin! In the summer it gives them many happy hours of digging for bugs amongst the grass cuttings and the straw from their coop. And in autumn and winter, rootling among the windfalls and and over-ripe fruit is a great boredom booster! And of course, that rich compost is a great nutrient for the plants we're going to be talking about very soon! 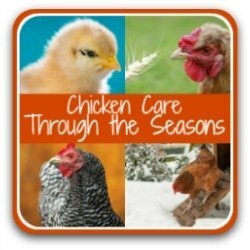 Want more information about chicken care in winter? Try these!